Here’s what we know about the Senate race. First, the Democratic nominee will be Kay Hagan. That is a certainty. There are a handful of Republicans with a chance to win the nomination (in today’s political environment, even candidates on the so-called fringe have a shot). The NC GOP hasn’t had to deal with an open Senate primary in quite some time. The last time was all the way back in 1992, when Lauch Faircloth went up against Sue Myrick, former Mayor of Charlotte. The Faircloth campaign blasted Myrick as a liberal. Myrick might also have been the victim of the ‘Charlotte curse’. Faircloth served one term in the U.S. Senate before being defeated by John Edwards. Myrick was elected to the U.S. House and served there until her retirement a couple months ago. 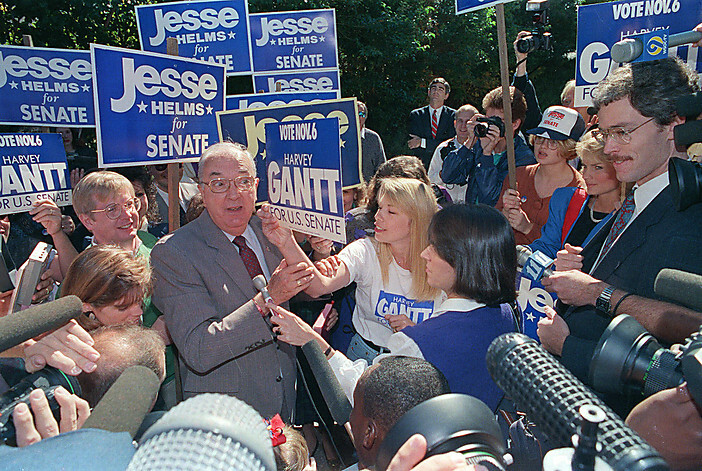 Jesse Helms ran for reelection in 1996, but did not run again in 2002. The star power of Elizabeth Dole pretty much cleared the Republican field, and she easily prevailed over Erskine Bowles in the fall. Richard Burr also did not face opposition when he ran in 2004. Dole lost reelection in 2008 but Burr won it two years later. One thing about North Carolina Senate contests: they’re always close affairs. Back in 2007, when Democrats couldn’t find a candidate to run against Dole, a lot of people thought she was going to win in a landslide. Those who understood North Carolina politics knew better. The fact of the matter is that no one’s been able to hit 55% in a Senate contest since 1974, before we were a competitive two-party state. At the presidential level, North Carolina has only been purple for a little while. But we have a history of bitter partisan divide in Senate races. A 2009 study found that North Carolina’s Senate contests are the most competitive in the entire nation, with an average margin of 6 points. There are a number of reasons for this, but mostly it’s because in Senate races the state coalitions are roughly even. Today, the coalitions in North Carolina’s Senate races are pretty much equivalent to those in a presidential race. In the past, you often had rural voters voting Democratic in Senate contests but not for presidential contests. These rural voters now vote Republican down the line, but Democrats aren’t hurting because they’ve replaced these rural voters with cosmopolitan liberals and a greater number of minorities, groups that are both less likely to split their tickets. So the partisan divide in Senate races continues, even though the coalitions that have produced this competition are slightly different than in the past. Given our history of close races, don’t expect a blowout in next year’s race. Not that anyone is predicting one for either side. If anyone was to win in a landslide though, I think it would be in a situation where Kay Hagan goes up against a Tea Partier who has a bad case of foot in mouth syndrome. Even then, I think they’d be guaranteed about 45% of the vote. This state is too divided, and too partisan, for any party to have an overwhelming advantage. In other Senate news, AFP is up with an anti-Hagan web ad, targeting her on the carbon tax.